Despite Wayne’s newfound BBQ burger prowess (click here to read about that), we celebrated our first coat of laying down boat trim varnish with a “chef’s day off” at… Wendy’s! combo" in St. Thomas, US Virgin Islands. Wendy’s makes some great salads; I eyed the chicken with pecans, blue cheese and dried cranberries. Then I ordered a burger. We gluttonously glugged down a baconator each and split a small fries and a Diet Coke. It hot, salty, greasy … good! Just off the I-5 freeway, we burgered up for a quick late lunch at Mickie D’s. Today’s meal, however, in Charlotte Amalie in St. Thomas, Virgin Islands, was deliberate. Now that we’re back in the U.S. territories, it was time for a test drive. We wondered, was it better to be “served” or do it ourselves? Wayne seemed neutral, swayed perhaps a bit too much by the bacon on the baconator. Maybe that’s because he did the BBQ and I got served. My take? 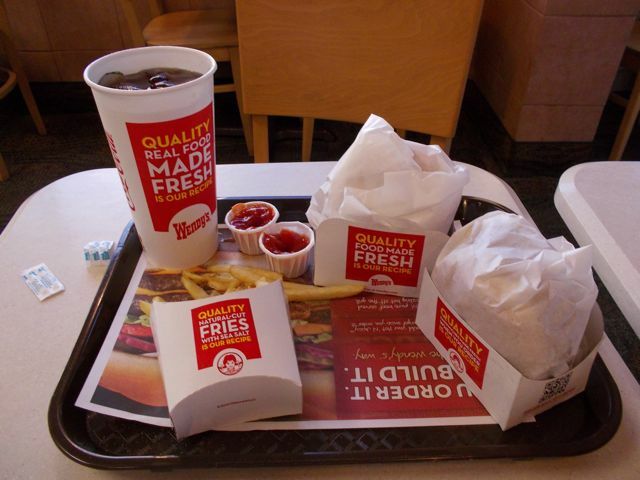 Wendy’s was not as good as Wayne’s burgers, even without bacon, but they were still good. Wayne’s burgers versus the DQ (Dairy Queen) in downtown Vancouver, Washington? Well, that’s another story. But I can tell you with certaintly, not all DQs are created equal. Downtown Vancouver, Washington’s DQ is special. Okay, now I can wait another 6 months to a year before getting my month’s worth of sodium in a single serving.